It used to be, for me. I can't tell you how many nights I spent lying in the long grass of the family garden, staring at stars as they twinked like fairylights hung from the heavens, wondering what in the world was out there. And wonder was the word, because whatever was out there—and I was sure there was something—it was awesome, obviously. I absolutely believed that, then. These days, damn it all, I don't know that I do. My fantasies are much more mundane in nature now. I get a nasty neck when I look up for too long; lying in long grass leads, as like as not, to another load of washing to manhandle in the morning; and on those increasingly rare occasions when I am given to ask what more there might be, I think: maybe this is it. But readers? Radiance by Catherynne M. Valente—"a decopunk alt-history Hollywood space opera mystery thriller [...] with space whales," according to the author—had me stargazing again. "Why, mummy? Why does everyone need Venus?" I imagine a young Severin Unck asking the latest lady on the arm of her famous filmmaker father. "Because that's where the Callowhales are at!" she, whoever she may be, would answer. "Well, they're these great big sleeping beasts whose milk we drink to stay strong in space!" "But why do they make milk, mummy? And do you think they mind us drinking it?" Severin, even then, would need to know. "Oh, my lovely little Rinny, you ask so many questions!" mummy number seven or eight would say. That, and only that, because even after using these creatures for so many years, nobody knows exactly what the Callowhales are, or why they produce the nutrient-rich fluid that's been a key part of humanity's expansion into the stars. Nobody's asked the questions because, at bottom, they're afraid of what the answers might mean for the species. Severin has no such vested interests. She's only interested in the truth, however embarrassing or hard-to-believe or indeed dangerous it may be. As the years pass and she follows her father into the filmmaking business, she makes a name for herself directing investigative documentaries come "confessional poems" (p.227) instead of the pulpy science fantasy he previously pioneered. The making of one such movie takes her and her tight-knit team to the scene of an untapped tragedy where, between one night and the next, the Venusian village of Adonis, and all those who called it home—largely Callowhale divers and their families—completely disappeared. But hearts aren't the only parts Radiance puts through the wringer. Brains, too, will be broken by this book, not least because its narrative is wilfully non-linear. We only hear what happened in Adonis near the end of the novel, though those events are in the past before it starts. To Valente's credit, this confusion of chronology is fostered from the first. Past the prologue—a wonderfully witty and self-aware affair—we're treated to two gossip columns composed thirty years apart. One describes Severin's funeral; the other her first public appearance. Next up, we're given a fleeting glimpse of the film she was shooting when she went missing, and enticed by a transcription of a home movie her father made when Severin was but a babe. Even the minutes of a production meeting between Percival Unck and his long-time screenwriter are obscenely intriguing. This last sliver of found fiction informs the most traditional sections of the text: parts of a prose story (or four) Percival plans to make into a motion picture, ostensibly about his dear daughter's disappearance. He casts one Anchises St. John as his central character, a private eye in The Deep Blue Devil, a nasty, noirish narrative that Percival eventually admits isn't quite right. So the noir turns into a gothic ghost story—The Man in the Malachite Mask—which reframes Anchises' "hardscrabble detective [as] a noble knight with a cigarette and a disease where his heart should be." (p.174) Latterly, that tales transforms too, into Doctor Callow's Dream: a fabulous fantasy which folks familiar with Valente's Fairyland fiction are likely to love, if only until it turns into a locked-room mystery in And If She's Not Gone, She Lives There Still. All this chopping and changing speaks to the idea that the truth Severin's father is trying to find isn't the truth at all. As a devoted father, if only after the fact, he's looking for closure, of course—and as a filmmaker, he's trying to find that through the medium he's spent his life working within. 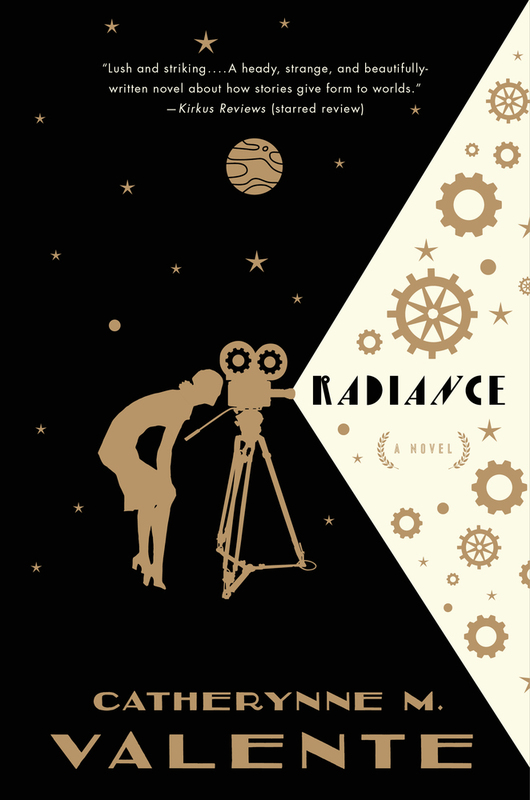 But, lest we forget, "the lens [...] does not discriminate between the real and the unreal," (p.54) and nor does Radiance, really. Everyone wants to know about my mothers, so why not lay it all out? But then I'd have to start over. From the beginning, because the beginning is where the end gets born. I suppose I could edit it back together so it looks like I started with Clotilde, which means starting with myself, with that morning and that doorstep and that ridiculous blanket. But that wouldn't be honest. That wouldn't be real. That would give you the idea that a life is a simple thing to tell, that it's obvious where to start—BIRTH—and even more obvious where to stop—DEATH. Fade from black to black. I won't have it. I won't be one of the hundreds telling you that being alive flows like a story you write consciously, deliberately, full of linear narrative, foreshadowing, repetition, motifs. The emotional beats come down where they should, last as long as they should, end where they should, and that should come from someone real and natural, not from the tyranny of the theatre, the utter hegemony of fiction. Why, isn't living easy? Isn't it grand? As easy as reading out loud. You might as well ask what life is! But however questing the question, Severin, I'm sure, would try to answer it, and so shall I.
I know that it's difficult. I know that it doesn't merely proceed from A to Z. I know that it has high points, and I know that it has lows. I know that it's entirely unreliable. I know, moreover, that bits of it are hidden, and that finding them is going to take time. But I know, as well, that the time would be well spent, because the truth is surely worth a little work. 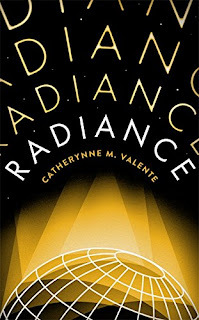 As captivating as it is frustrating, and as playful as it is profound, Radiance is the most ambitious and the most difficult thing Catherynne M. Valente has ever written: a love letter to silent film and science fiction penned by a truly striking stylist.